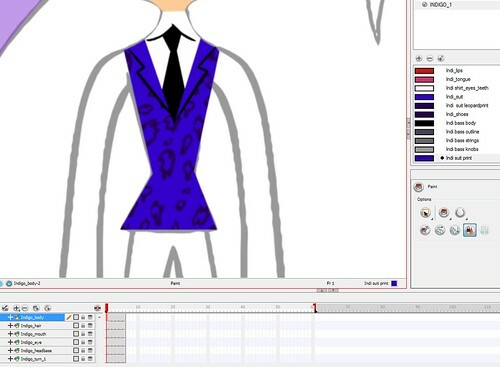 Before vector animation hit the scene, back in the "traditional animation" days we created character color palettes in Animo (remember Animo?) 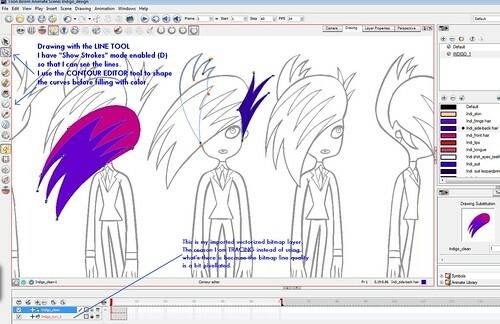 We LOVE that there are character color palettes in ToonBoom ANIMATE! A screengrab below shows that you can name the swatches and if you edit one color, then all drawings of that item painted with that color will change accordingly. There is also no confusion which color goes where. Color palettes are saved in a Palette library external to this file so you can easily share palettes with other artists. 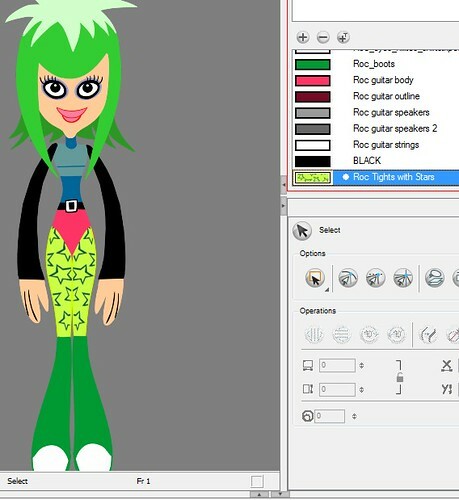 I had actually created Rocquita color palettes in Toonboom DIGITAL PRO last year and imported them into this ANIMATE file. Here are some screengrabs showing the Import Texture/Painting with Texture feature in Color Palettes. 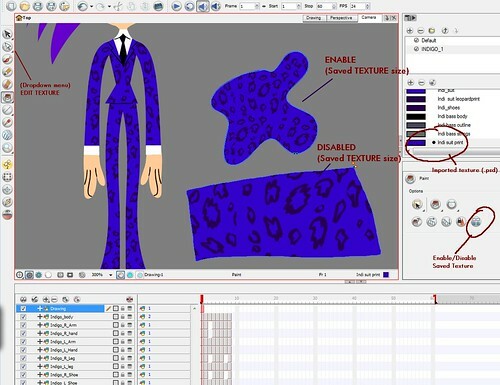 Below is another example with our character Indigo, who wears a dark blue leopard print suit. 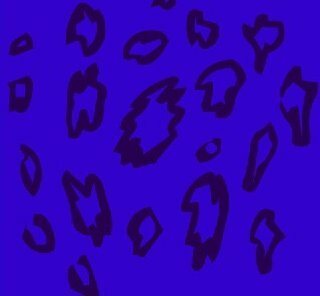 First the PSD file of the "leopard print"
I imported the PSD into my Palette and it generate a swatch which I renamed "indi suit print". Then painted the character as normal. What's cool is that ANIMATE lets us edit the texture (scale, skew, rotate etc.) and then we can save the transformation to keep it consistent whenever we paint it. Before you fill an area, click on the Enable/Disable Saved Texture button (I think this is what it's called) in the Paint Properties window. When Enabled is on, you get a consistent-looking pattern or texture regardless of what size the fill area is. The screengrab above shows two sizes of leopard print - the top shape is using my Saved Texture size (same as Indigo's suit). The larger bottom shape has the feature disabled so the leopard print fill is much larger. I was thrilled to learn recently that I can draw with "invisible strokes" in ANIMATE so I did this with my construction of Indigo. To draw with invisible strokes, create a Pencil tool setting with 0 width. In this case I was drawing with the Line and Contour Editor tools and I enabled the "Display Strokes" setting (keyboard shortcut = D) so that I could see my strokes. this is great,i was tihinking how to make the look of samurai jack, with no outlines, did you know which program mccraken use to make foster´s? the cool tip is invisible strokes really helps and i was wonder about something you draw the whole character out side toon boom and you trace it in ? 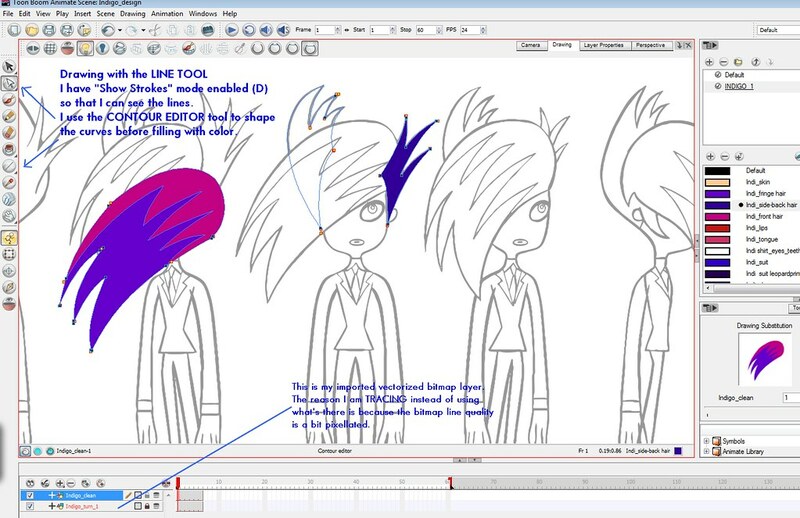 i have to assume it 's not good to draw inside toon boom animate ?if so why? Hi Anonymous, thanks for commenting! There is no reason why you can't draw inside Animate. It's just that I had already drawn this character (in Flash) a long time ago so all I did was import it, and trace. thanks to you Eddie and Lili you are awesome . draw with visible strokes or brush and fill it and then cut out and distribute to layer or use invisible strokes and cut out and distribute to layer or draw in separate layer first and then using line and color art function . i still discovering best work flow but do u have any advise (use cutout process not paperless ) .